As one of the leading sugar daddy dating sites in the world, SeekingArrangement.com has made a major splash online and in the media. The site has been featured in publications like the New York Times and on shows like 20/20, CNN, Dr. Phil, and Dr. Drew. 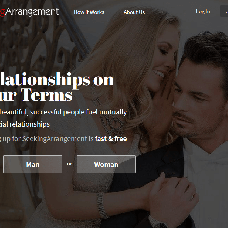 “Mutually beneficial arrangements” is the name of the game at SeekingArrangement, which matches successful and wealthy benefactors with attractive men and women looking to be spoiled. SeekingArrangement was founded in 2005, and since has helped thousands of aspiring Sugar Daddies and Sugar Mommies find Sugar Babies to pamper. The site prides itself on being a focused, easy-to-use resource for a select clientele. The profiles are designed around only one goal:asking the questions necessary to create a mutually beneficial arrangement. Thanks to that targeted focus, there’s no fuss, no muss, and no confusion about what anyone is looking for on SeekingArrangement.com. Free users can also take advantage of limited messaging functionality. Sugar Daddies and Sugar Mommies with Standard memberships can send up to 10 messages at no cost, though they cannot view incoming messages. Sugar Babies can send and read messages once one approved picture has been uploaded to their profile. Contact info is also not allowed in messages to or from Standard Sugar Babies. For access to priority listings, stronger privacy settings, and the full range of features, users can upgrade to a paid membership. We wrote the book on Sugar Daddy dating, and turned the Sugar Lifestyle into a part of pop-culture,” says SeekingArrangement. “So if you are choosing a website to use, consider the leading trend setter, not just another copycat site.” It’s a big claim, but the site mostly lives up to the hype. If you’re looking for a mutually beneficial arrangement – a term the site claims to have coined – SeekingArrangement may be the perfect way to meet like-minded people who know what they want from life and aren’t afraid to ask for it.